Phil has written many beautiful songs including-The Molly Maguires-The town I loved so Well and many pop songs also. This song is about Phil's son Paul Coulter who was born with Down's Syndrome. It so happened that at the same time Phil was producing the Dubliners, and Luke Kelly picked up on the song. Luke didn't preform the song with any of the Dubliners gigs as he didn't think the Dubliners audience would get the song. In a recent interview for Irish T.V. Phil said if there were any two songs he's like to be remembered for it would be The Town I Loved So Well and Scorn Not His Simplicity.Did you know that Phil wrote most of The Bay City Rollers hits ? The video is from 'The McCann Man [Jim McCann from the 70s , I think it was recorded in the Embankment Tallagh Dublin. The chords that I have set the song in are the same as the Luke Kelly version.Irish country singer Mike Denver recently recorded the song. Scorn not his sim[Fm]plicity oh[G] no,oh[C] no. Scorn not his simplicity oh no,oh no. Only he knows how to face the future hopelessly sournded by dispair. He wont ask for your pity or your sympaty but surly you should care. Scorn not his sim[Cm]plicity oh[D] no,oh[G] no. Some voices have an awesome but distant beauty. is not one we could imagine emerging from our own throats. of our own banal ordinariness. and deepest despair, they remind us of our inarticulate selves. They make noises that we recognise. We can feel at home in their comfortable banality. between these two states it is otherworldly but not alien. recognise, Its perfection doesn't tantalise or pander, it simply connects. it is strange commanding, majestic. But is speaks to us of ourselves. 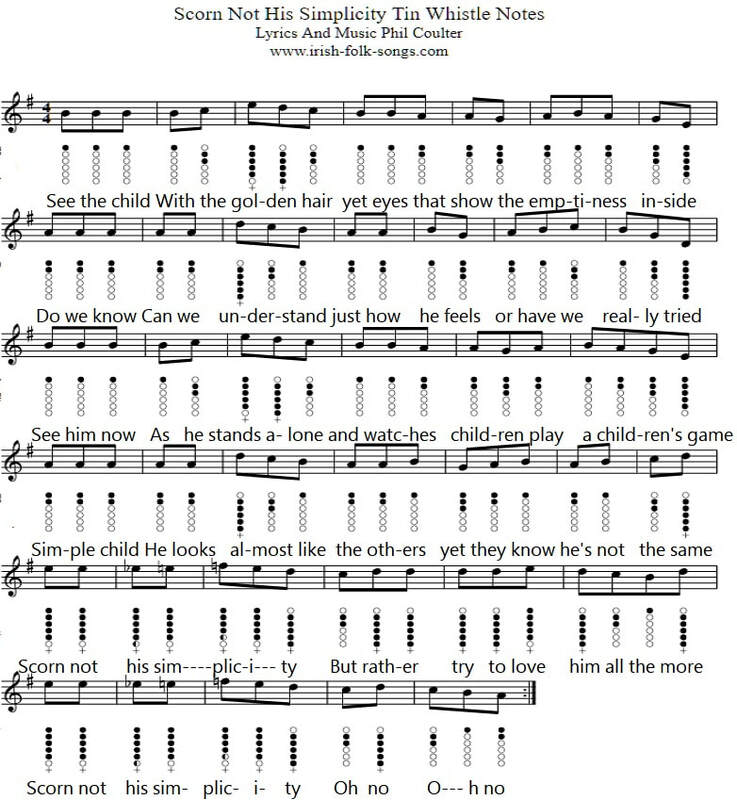 Below is the sheet music notes for the tin whistle in the key of G. The notes are suitable for playing on a standard D whistle.